I built a wall this summer holidays, or more correctly, I, ably assisted by my three children and another teenager, built stage 1 of a retaining wall project to turn my steeply sloping garden of useless grass into a place of three levels with space to sit and space to enjoy God’s creation outdoors. It seemed that any bloke that I spoke to thought it fair game to give me free advice on how to build said wall. It would have been good if the advice had been consistent, but instead all the advice came from each person’s own experience and situation. The result was rather confusing! So what did I do? I thanked them all for their advice, and then turned to the font of all knowledge, the internet! 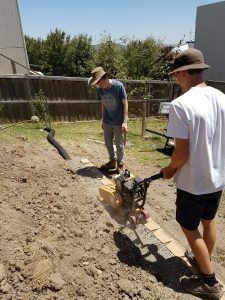 After a few You tube training videos, and keeping in mind the spirit of the wisdom that had been shared with me, I determined that there were three key points to building a strong retaining wall – good well compacted foundations, keep all work level, and remember to include drainage. That’s what Paul says today to the group in Corinth, who were struggling – it all comes back to the strong foundations of your faith. He reminds them that the well compacted foundation is Jesus Christ. Nothing else will do. He says that different materials of varying quality can be used for building on top, but it still depends upon the foundation, for we are not always in control of the opportunities that form us. Your foundations need to be strong, but your building must not be too rigid, for a degree of flexibility will allow the wall to survive in a changing environment. Remember the brick layer’s mantra, walls are strong in compression, but weak under tension. If your life in Jesus Christ was part of a wall, how would it fare in compressive tough times? And how would it survive living through times of tension? Not only our foundations, but our whole bodies are holy, says St Paul, as he reminds us that as God’s Holy Spirit dwells within, we are part of God’s moving holy temple. Not fixed in one part of the world, but moving and connecting with the world around us. What a gift we have been given! Go well this week, and remember to talk to your parish councillor.